While eating lunch, Deefor was surrounded by a bunch of kids on their way home from school. One observant boy pointed out a large nail sticking out of Deefor's rear tyre. Not too dangerous but it might have made for an interesting "moment" if it had come out at the wrong time. Well done that lad! "Too tse chay" (Thank you). The nail was pulled, the tyre plugged and Deefor was back on the road. Good as new. 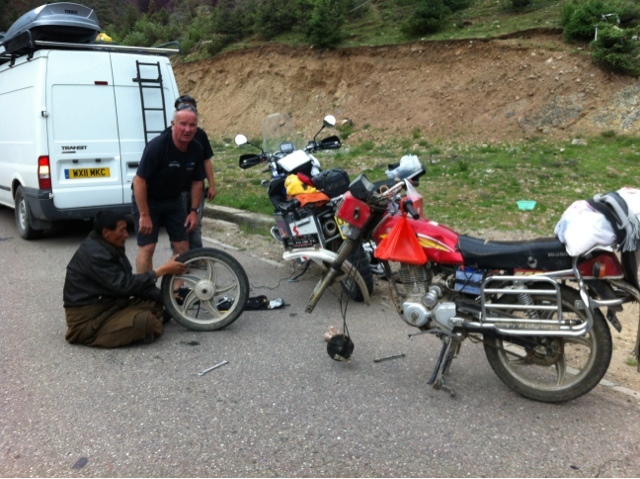 One hour later, in the middle of nowhere, a Tibetan motorbike was parked by the road. The rider was looking for help, he had a flat tyre. Deefor's over specified toolkit went into action. In no time the wheel was off, the puncture repaired and the tyre reinflated. After one false start and some back-up from Tintin and Snowy, we had him back on his way. Karma - What goes around, comes around.